Earlier this week, the Department of Labor (DoL) increased the threshold at which salaried workers receive overtime payment for working more than 40 hours per week from $23,660 to $47,476 per year, effective December 1st, 2016. This ruling affects academics engaged primarily in research, including postdoctoral researchers. A summary is discussed in the New York Times article, White House Increases Overtime Eligibility by Millions and how it will specifically impact higher education (including teaching exemptions) is covered in Overtime for Some and DoL guidance documents. The salary level will be reviewed and revised upward every 3 years. This means that institutions must either 1) track postdocs’ hours and compensate them for working overtime, or 2) raise their salaries above the threshold in order to comply with the new regulation. To ensure that their postdocs are compensated above the salary threshold, or to track their hours, it will be necessary for institutions to identify all postdoctoral researchers. This is not yet done at all institutions, as has been highlighted in reports dating back as far as 1969. FoR has been working with the American Society for Biochemistry and Molecular Biology (ASBMB) to address this issue (see 4 reasons why we don’t need 37 names for postdocs and Biomedical research workforce summit makes strides in implementing change for postdocs). Salary increases for postdocs have been recommended by a wide range of reports (Rescuing US biomedical research from its systemic flaws; Sustaining Discovery in Biological and Medical Sciences; Shaping the Future of Research: a perspective from junior scientists; Biomedical Research Workforce Working Group Report and summarized in Toward a sustainable biomedical research enterprise), but they still fall short of the $50,000 minimum urged by the NAS report “The Postdoctoral Experience Revisited,” the National Postdoctoral Association, and previous reports when adjusted for inflation. Further, salary increases address just one of the recommendations made by these reports, which include provisions for yearly inflation indexing, regional cost of living adjustments and minimum standards for non-salary benefits for all postdocs. Rather than accepting the proposed DoL recommendations and working together to advocate for more funding to accommodate these changes, a concerted effort was made by groups such as the Association of American Universities, the National Association of Independent Colleges and Universities and the American Association of Medical Colleges (AAMC) to keep the labor that drives research as cheap and plentiful as possible. We see this action as antithetical to the protective role institutions should have towards their trainees, and only exemplifies why so many graduate students and postdoctoral researchers are organizing and unionizing. Notably, labor union organizations explicitly represented postdoctoral interests to the DoL in this debate. It is disappointing to see that institutions have already begun to push back against the ruling (see “Colleges push back against Obama’s overtime rule” in this link). The AAMC’s public statement mentions the Protecting Workplace Advancement and Opportunity Act [S.2707 and H.R.4773], which they are endorsing. This would nullify the updated rule, require the DoL to complete “certain required actions” before proposing any similar rule, and would bar the DoL from implementing any procedure to automatically update the threshold in response to inflation. FoR is opposed to this Act and will continue to advocate for junior scientists in the face of such activity, and for fair recognition of and compensation for junior scientists (see Fair Postdoc Compensation by the Numbers, below). We at FoR stand in support with statements made by the National Institutes of Health, the National Postdoctoral Association and Rescuing Biomedical Research on this issue, and look forward to working with these and other groups to encourage implementation of the rule. 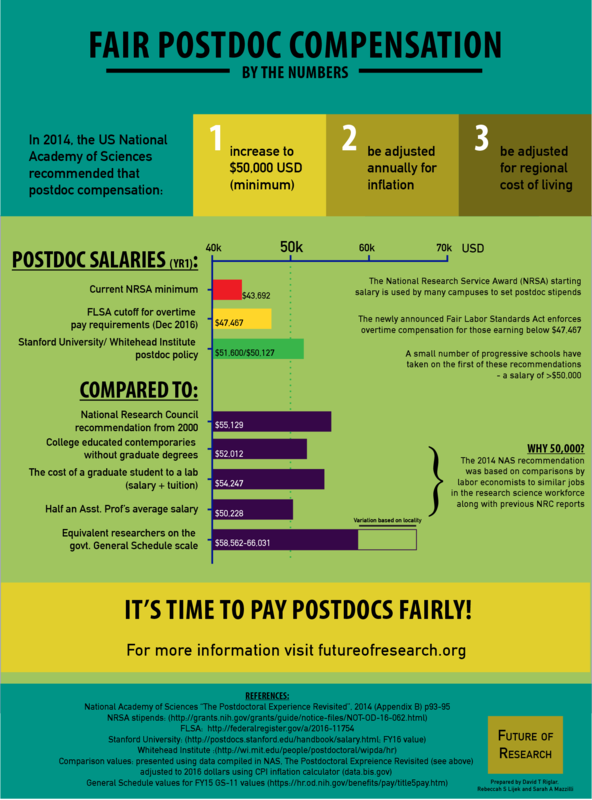 Fair Postdoc Compensation by the Numbers. Infographic based on data from The Postdoctoral Experience Revisited (2014) by FoR Board members Drs. David Riglar, Rebeccah Lijek and Sarah Mazzilli. Why not have he NIH budget add a line item equaling 2-4 years of years salary of say $100,000 for each Ph.D. Graduate to be auctioned off to existing research groups to compete for, where they would not only get the money but would have to employ the corresponding” Ph.D.